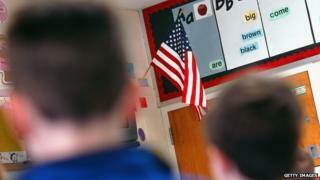 A school in New York state has apologised after receiving complaints because a student recited the US Pledge of Allegiance in Arabic. The school's foreign language department arranged for the pledge to be read in a different language each day for a week. Complaints were received from people who lost family in Afghanistan and from Jewish parents, an official said. Neither the US nor New York state has an official language. The school district superintendant, Joan Carbone, told the Times Herald-Record newspaper that the Arabic pledge had "divided the school in half" and that she had received numerous complaints. A statement from the district apologised "to any students, staff or community members who found this activity disrespectful" and said the reading was intended to "promote the fact that those who speak a language other than English still pledge to salute this great country". An Arabic-speaking student read the pledge during morning announcements at Pine Bush High School in Pine Bush, New York, on Wednesday. Officials said the school's foreign language department organised for different pledge translations to be read in celebration of National Foreign Language Week. Many students reportedly shouted their disapproval during the recitation, and later complained on social media. Later in the afternoon, the school's principal made a school-wide announcement to explain why the pledge was read in Arabic and to apologise to those who took offence. Ms Carbone said the pledge would only be read in English in the future. The school's student leader, Andrew Zink, who is in charge of the morning announcements, told US media that he knew the reading would attract controversy. He permitted it to go forward, because he believed it was "the right thing to do". "What makes you American is not the language you speak, but the ideas you believe in," he said. Sadyia Khalique, a spokeswoman for the New York chapter of the Council of American-Islamic Relations, said: "All Americans who value our nation's history of religious and ethnic diversity should be concerned" by the reaction and subsequent apology. Arabic is not widely spoken in Afghanistan, where the major languages are Dari and Pashto.